Many enterprise organizations have sensitive files stored cross the enterprise using a variety of technologies and security controls. As bad as this is, environments are actually getting worse as today's complex IT architecture is expanded with cloud and mobile computing. Addressing this problem with status quo solutions won't work, so what will? ESG believes it's time for CIOs and CISOs to take a long look at centralized cloud-based content management services. New offerings provide enterprise scale, simplify IT operations, and extend security controls into the cloud better than a complex amalgam of internal technologies. 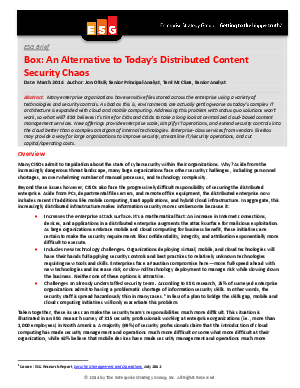 Enterprise-class services from vendors like Box may provide a way for large organizations to improve security, streamline IT/security operations, and cut capital/operating costs.